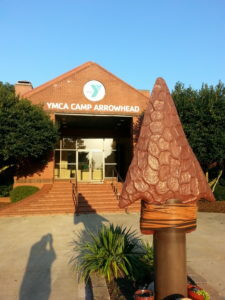 On September 19th, members came together at the Camp Arrowhead YMCA for the chapter’s annual banquet. The evening began with a welcome introduction by chapter president, Ray Powell. A delicious catered dinner of ham, turkey, dressing, sweet potato casserole, green beans, jello salad and a wide array of deserts was served. After dinner the chapter’s Tobin Award was presented. There is only one Tobin Award given by the chapter each year. The award recognizes the chapter’s most outstanding and dedicated member for contributions made throughout the year. Tim Doxey, awards committee chair, presented the 2017 Tobin Award to Gary Brown. Gary joined the chapter in 2010 and is currently serving on the Board of Directors. Gary regularly participates in chapter events and routinely steps up to help out. Gary recently stepped up to fill a vacancy as the chapter’s conservation committee chair. 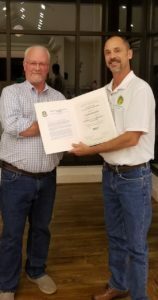 Gary has attended several conservation related meetings with the city and is working to strengthen the chapter’s relationship with the local community. Even though Gary has a demanding full time job, he is a valued chapter member who continues to give his all in support of our chapter’s goals. Joyce Dugan, scholarship raffle committee chair, conducted the scholarship raffle drawing. President Ray Powell, with the assistance of young “IKE” Shane Brown, drew the winning tickets. Congratulations go to John Lang (first prize, Williamsburg Romantic Escape), Cassandra Stanley (second prize, Busch Gardens Howl-O-Scream 4 ticket voucher), David Powell (third prize, VIZIO 32″ HDTV), and David Perdue (fourth prize, Bush gardens Christmas Town 4 ticket voucher). The evening concluded after Wanda Gerard graciously presented gifts and potted mums to all the women present at the banquet. Those members who could not attend missed out on an evening with lots of fellowship, fun and good food.